I want a lot of things in life. I want my extended family to get along better. I want my health and the health of friends & family to be better. I want to see people in my neighborhood be more considerate of each other's needs. I want to see more Christians love and serve each other. I want to see evil people and the wickedness they inflict upon society receive the righteous justice they deserve. I want to see peace in those places where there is nothing but warfare. I want to see more people help the poor, the widows, and the fatherless, not simply with handouts, but with a hand up, to lift them up and care for them. I even want all of these things to be righteous desires. I certainly hope they are all righteous desires. But when all is said and done, whether all of my wants are righteous, I know I want a lot of things. The Lord is my shepherd, I shall not want. He maketh me to lie down in green pastures. He leadeth me besides the still waters. He restoreth my soul. ...Yea, though I walk through the valley of the shadow of death, I will fear no evil, for thou art with me. This theme is sometimes mistakenly understood in two ways: In one sense it's viewed as though our trust in the Lord should be so great that our desire for "things" should be minimal. Instead, we think the Psalmist is telling God something to the affect of, "I will not want (anything) because You are my Shepherd who provides all things." In another sense, it's as if the Psalmist is responding to one of God's commands, "I shall not covet" or "I shall not steal," only this time it's "I shall not want." In this sense, we think the Psalmist is expressing some kind of desire to be obedient to the Lord's will by not thinking wishfully. If we sometimes think this is the point of the Psalmist, it may be because we often don't realize that the word for "want" can be used in a variety of senses, only one of which means to desire or wish some thing. But that really isn't what the Psalmist is describing in Psalm 23. The Psalmist is not communicating to God that he will not be desiring or wishing anything inappropriately in the future. Instead, the Psalmist is declaring that he lacks nothing. 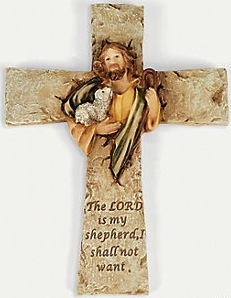 "The Lord is my Shepherd. I shall not be lacking," is the idea. In fact, the original Hebrew could even be translated as: "Yahweh shepherds me. I lack nothing." 1) It teaches us that when we feel as though we are lacking some thing, we never really are if the Lord is our Shepherd. The basis of our assurance for never lacking any thing, is that the Lord is our Shepherd. 2) It teaches us that the Lord is not simply a shepherd. If the Lord were simply a shepherd, that doesn't necessarily mean that he chooses to shepherd me, which is the only legitimate basis I could ever have for declaring the words "I lack nothing" with confidence. The Lord is more than a shepherd. The Lord is my Shepherd. I lack nothing because the Lord is my Shepherd. He shepherds me. 3) Lot's of people quote this Psalm in times of trouble because it's very familiar to them. It's quoted so frequently and so loosely that people often take for granted that this Psalm is their Psalm. Some people think they have nothing to worry about in death because they know this Psalm. They know that even if they were to "walk through the valley of the shadow of death," God is with them. The proof that God is with them is that they have this one Psalm memorized. But yet, many of these very same people don't live a life of trust which matches up with the claim of this Shepherd Psalm. They are really not content with many things that are lacking in life, but they talk as though God will be with them in the end and God is on their side. God is their pious excuse of hope when a lot of things are, in fact, lacking. In such sad cases, they may feel that way because they lack the most important thing in life: the Lord as their Shepherd. The opening statement of this Psalm teaches us that if the Lord is our Shepherd, not only can we say with confidence that we lack nothing and mean it, but we can also say that we have every thing we could ever desire and wish for, and mean it.